A middle school science genius chooses an unusual way to get the girl. Lenny Cyrus isn’t your average 13-year-old. 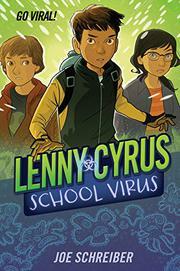 Growing up with two science geniuses for parents, Lenny is more comfortable with lab rats than his peers. So when it comes to winning the affections of Zooey Andrews, Lenny doesn’t settle for any of the usual tactics. Instead, he devises a plan to shrink himself down to the size of a virus and, with the help of his best friend Harlan, go inside Zooey and literally change her mind. Told from the alternating perspectives of Lenny, Harlan and Zooey, the story offers plenty of humor and action, but what really sets it apart are the complex emotional layers that add depth and a heightened sense of urgency to Lenny’s quest. Though Lenny’s purported mission is to slip into Zooey’s system unnoticed, what he truly wants more than anything is to be seen by Zooey and, perhaps even more importantly, to be seen by his own parents. Lenny, Harlan and Zooey each have their own distinct and engaging narrative voices. It’s especially refreshing to see that the object of Lenny’s affections is a strong, smart young woman. While Schreiber does a good job keeping things light, some of the science-speak can feel a bit overwhelming.